I spent a brief few days in UAE and thus this shot, to smoothly glide from the previous bunch of auto shots to a quick series from the UAE. Well not from all of UAE, just Dubai and Sharjah. 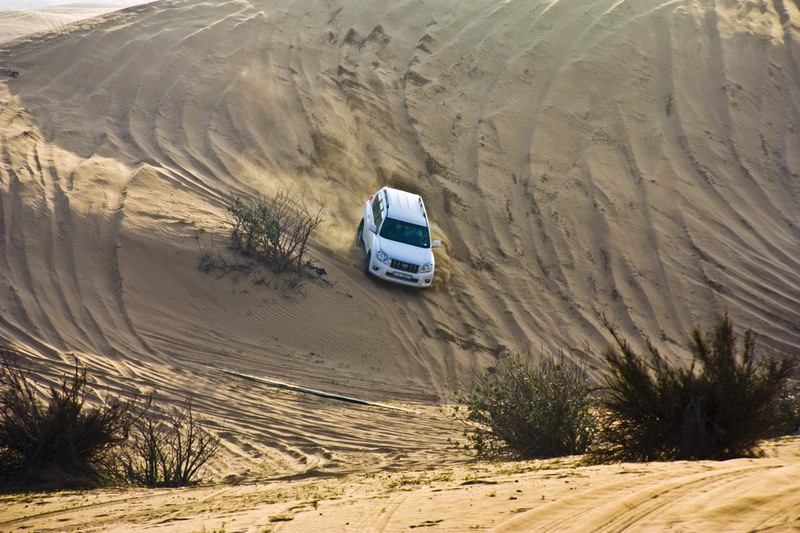 This is an example of dune bashing: massive SUVs with screaming tourists strapped in their seats and the drivers with smiles permanently pasted on their lips, lurching the vehicles up and down the dunes. I could swear that every now and then, these huge vehicles were air borne. Once the ride ended, some of the guests would stumble out and yell "I hate you!" at the driver. He would grin broadly, taking that as a compliment. A brilliant shot Ayush! I love the light and the color. I am surprised they use SUVS to ride the dunes since they have a great tipping hazard. did you lose your way to the mall ? Very nice action shot - thought I agree with Ray on treating the dunes with such disrespect.. I agree with the others. I wouldn't do it but a great photo opportunity. Were you in one too? I would never do it as I am terrified of such action - if I am in the car. Good for the dare devils. Whatever happened to a nice ride on a camel? A fine shot Ayush but I think I'd rather be in control and driving rather than a passenger. L'inclinaison de la voiture donne tout l'attrait à cette magnifique photo ! Well taken Ayush, but surely the most terrifying rollercoaster would give a less uncomfortable ride? Fantastic picture. I am delighted with it. I wish you have a nice weekend. Nice action shot and I can imagine some passengers Over here they don't take kindly to dune bashing. I can almost visualize the SUV doing a somersault down the side of the dune, Ayush. Do tourists actually pay for these rides?